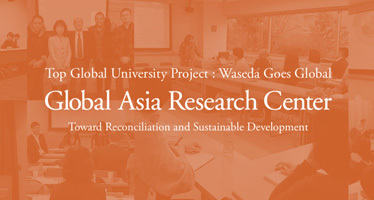 Since its establishment in 1951, Waseda University’s Graduate School of Political Science has produced more than 1,200 researchers and educators who have gone on to contribute to society in a diverse array of fields. Currently (as of April 1, 2006), the Graduate School of Political Science is comprised of 45 faculty members (25 full-time faculty, 7 faculty affiliated with other Waseda institutions, and 13 part-time faculty), 97 Master’s Program students and 71 Doctoral Program students, all of whom are engaged in political science-related education and research. The aim of the Political Science Course is twofold: to examine the history of political science as an academic discipline from its establishment in ancient Greece through its development in the latter 20th-century United States to become what it is today, and to use this as the basis for forward-looking research and education for identifying what is currently most normative internationally as well as new developments that can be expected in the 21st century. In order to achieve this, an education and research system built around five areas of study has been developed for studying political science in a manner both highly specialized and broadly comprehensive. The first research area specializes in theories of contemporary politics. This research area covers a number of theories in contemporary politics, the analysis of modern Japanese politics, and the comparative contemporary politics of developed nations such as the United States, United Kingdom, and Italy, for example. This area also includes courses on the theory and analysis of media and communications. The second research area specializes in political thought and political history. This research area explores the history of political thought of the West and of Japan, together with modern normative political theory. The distinguishing feature of this set of courses is that they study constitutions closely related to political history and political philosophy. The third research area specializes in comparative politics. This research area analyzes global politics from a comparative as well as a historical point of view. A wide variety of approaches, including the positive approach, is applied to analyzing contemporary world politics within a global context and from the perspective of Japan’s place in the world. The fourth research area specializes in international relationships. The disciplines of international politics, international relations theory, the history of international politics, and the history of foreign diplomacy are used to analyze contemporary international relations. The research methods allow for a comprehensive examination of history, ideology, and theory in approaching international relations from a global perspective. The fifth research area specializes in public policy theory and policy analysis. Using such disciplines such as public administration, local government administration, and international public administration and in conjunction with administrative law as well as political structures and systems, public policy theory and policy analysis are studied from the local to the global level. The Graduate School of Political Science promotes research and education in close association with the Okuma Institute of Public Management. However, the field of study in our Graduate School focuses more on the theories and analysis of public policies which have developed with a close relationship to political science while the aim of the Okuma Institute of Public Management is to nurture and educate professionals who are specialized and extensively engaged in the field of public management. The above five areas of study encompass the interests of a majority of people who seek to study political science. It should be noted, however, that the instructional system employed by the Graduate School of Political Science promotes an approach to research that cuts across different fields of specialization and transcends existing frameworks. To enable students to utilize this approach and develop the requisite research capabilities, we strongly emphasize a multifaceted methodology for studying political science. This methodology is comprised of the three elements of empirical procedure (such as statistical analysis), mathematical analysis (such as game theory) and normative theory (involving the study of politics from a diverse array of value systems). We work to ensure that the methodology courses that constitute the foundation of these three methodological elements are in line with international standards, and it is this methodology that undergirds all research conducted in the Political Science Course. We also firmly believe that it is responsible for the production of creative and internationally noteworthy research. During the 2006 summer break, an intensive, advanced course methodology seminar (in Karuizawa) was held; this “collective workshop” was attended by nearly all of the first year Master’s Program students and involved a good deal of research exchange. It is through such practical initiatives as this that we lay the groundwork for the cooperation needed to build a robust political science that applies a multifaceted methodology across five areas of study. And it is these sorts of initiatives that were recognized by the Ministry of Education, Culture, Sports, Science and Technology as “Initiatives for Attractive Education in Graduate Schools” during the 2005 to 2006 academic years. We are working to strengthen these initiatives even further. One pertinent characteristic of the Graduate School of Political Science is its position above the School of Political Science and Economics; thus, the faculty of the Graduate School of Political Science and the Graduate School of Economics are treated as one. In other words, we have created an environment where students can study political science in close connection with economics – a field with which it is intimately connected. This offers a tremendous advantage to students, given that politics and economics are so closely linked in today’s world. The world is rapidly changing. As a graduate school we are tackling new challenges head on through continued innovation that allows us to put in place a uniform and systematically advanced educational structure for our Master’s through Doctoral Programs, culminating in Doctoral Degree conferral, but which also provides the kind of professional education at the Master’s level that will equip graduates with the essential tools and working knowledge that they will need as professionals in whatever field they pursue. 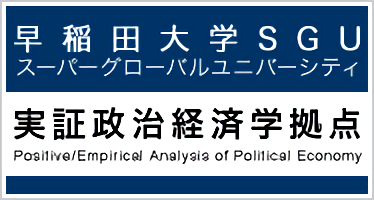 The Political Science Course promotes a systematic and sophisticated approach to political science education within the Graduate School of Political Science and endeavors to be a beacon of international comparative research originating in Japan and firmly grounded in the latest theories and methods employed in the field of political science. 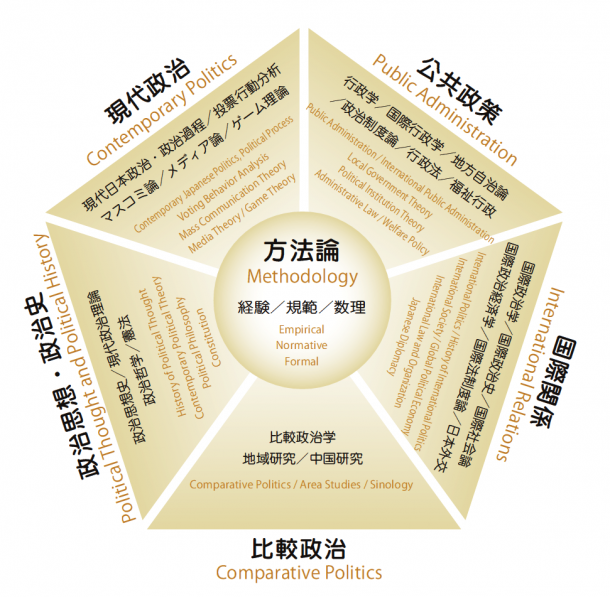 Here, researchers are equipped with the most current and globally accepted political science methodologies as well as an intrinsic understanding of Japan and Asia. 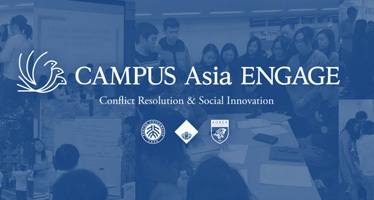 At the same time, this course aims to cultivate hands-on experts who, as masters of science well-versed in the specialized knowledge of political science, are capable of demonstrating leadership in various areas to build a more just society and who can serve as the voice of Japan and Asia in promoting a well-ordered global community. ※This course will be merged with the Graduate School of Economics in AY2017. If you would like to know the detail, please click here. The Global Political Economy Course is a cutting-edge program which adopts an international perspective in analyzing and understanding the inseparable link between politics and economics while seeking to open up a new field of academic study where feasible policies are discussed and shaped from a normative perspective. This course provides opportunities for students to develop a higher level of expertise and an international mindedness so that they can serve in a variety of areas in society, and it cultivates practical-minded human resources with a global vision who seek to contribute to the international community. Furthermore, students rigorously study the techniques involved in political science and economics so that after the completion of the Master’s Program they can continue on to a degree-conferring program to obtain a doctorate in either political science or economics and become researchers who will contribute to the creation of a true political economic science. The Journalism Course, in keeping with the standards of the Graduate School of Journalism – one of the world’s leading-edge graduate schools of journalism – promotes an educational program that develops highly-skilled professionals grounded in the five elements required of all journalists.1. Expertise, i.e., scientific knowledge and philosophical understanding for a broad range of specialized fields. 2. Deep insight into the role of journalism and the media. 3. The ability to think critically. 4. The ability to report professionally and articulately. 5. A hands-on approach, i.e., experience which is based in the field. At the same time, the course fosters the development of the foundations of journalism by promoting specialized research and cultivating researchers.The Journalism Course seeks to cultivate professional journalists with a practical approach to ethics, knowledge and technology who also distinguish themselves in terms of specialized knowledge. The Journalism Course provides a true meeting point for academia and journalism, fostering those who will promote public communication and thereby create a bridge between specialized knowledge and civil society. The Master of Arts Program for Journalist Education in Science and Technology is an ongoing program within the Journalism Course which has a particular focus on cultivating exceptional journalists specialized in the areas of science and technology. The Political Science Course aims to cultivate researchers equipped with both the most current and globally accepted political science methodologies as well as an intrinsic understanding of Japan and Asia. At the same time, this course also aims to cultivate hands-on experts who, as masters of science well-versed in the specialized knowledge of political science, are capable of demonstrating leadership in various areas to build a more just society and who can serve as the voice of Japan and Asia in promoting a well-ordered global community. To this end, students in the Master’s Program will acquire a comprehensive understanding of political-science research approaches, comprising the empirical approach, mathematical analysis, and the normative approach, and use this as a basis for deepening their knowledge of research methodologies essential to their own areas of research. Thereafter, the student will write a Master’s thesis representing the culmination of efforts to develop a multifaceted understanding of one’s own research area as well as other related research disciplines. The Master’s thesis will be evaluated from the perspectives of further development potential and practical applicability for conferral of the Master’s Degree in Political Science. In the Doctoral Program, students must demonstrate mastery of basic knowledge of political science in not only their own specialized research area but also at least one other related research area, with coursework in research approaches, academic presentations and other areas as prerequisites. From this foundation, a doctoral dissertation plan will be formulated. Doctoral candidates must then receive research guidance from the Doctoral Dissertation Committee based on the doctoral dissertation plan. The Doctoral Dissertation will be evaluated as the culmination of this uniform five-year research process beginning with the Master’s Program, for conferral of the Doctoral Degree in Political Science. The Global Political Economy Course provides opportunities for students to develop a higher level of expertise and international mindedness so that they can serve in a variety of areas in society, and it cultivates practical minded human resources with a truly global vision who seek to contribute to the international community. Students enrolled in this course are expected to systematically learn both political science and economics, and creatively develop the new research area of political economic science while receiving joint research guidance grounded on expert perspectives in both political science and economics. The Master’s thesis will be evaluated as the culmination of these efforts, for conferral of the Master’s Degree in Global Political Economy. For Students who have completed the Master’s Program, the path is available to them to continue on to the Doctoral Program in the Political Science Course to engage in more in-depth research in their areas of specialty. The Global Political Economy Course aims to help provide opportunities to develop a higher level of expertise to students who are seeking to develop a higher international mindedness and succeed in a variety of areas in society. Accordingly, students who complete all coursework requirements for the Program for Cultivating Global Governance Professionals, and receive a passing grade for their Master’s thesis shall be granted the Master’s Degree in Global Political Economy. ※The Global Political Economy Course will be merged with the Graduate School of Economics in AY2017. The Journalism Course seeks to cultivate professional journalists with a practical approach to ethics, knowledge and technology who also distinguish themselves in terms of specialized knowledge, as experts who will promote public communication and thereby create a bridge between specialized knowledge and civil society. To this end, students will complete a comprehensive educational program that develops highly skilled professionals grounded in the following five elements: (1) expertise, i.e., scientific knowledge and philosophical understanding in a broad range of specialized fields; (2) deep insight into the role of journalism and the media; (3) the ability to think critically; (4) the ability to report professionally and articulately; (5) a hands-on approach, i.e., experience which is based in the field. Students who receive a passing grade for their Master’s thesis (including journalism work) shall be granted the Master’s Degree in Journalism. The purpose of the Doctoral Program is to cultivate specialized researchers in journalism and media, professional journalists with an even higher level of specialized expertise, and educators of journalists. In the Doctoral Program, students will complete an educational or research program structured from each of these perspectives. Students who receive a passing grade for their Doctoral Dissertation shall be granted the Doctoral Degree in Journalism. The Graduate School of Political Science has remained responsive to the ever-changing needs of the times, and as a research and educational institution on par with the best in the world, it seeks to offer a fresh perspective in the 21st century, cultivating political scientists and highly specialized professionals who will serve as international human resources to contribute to world peace and the welfare of humanity. 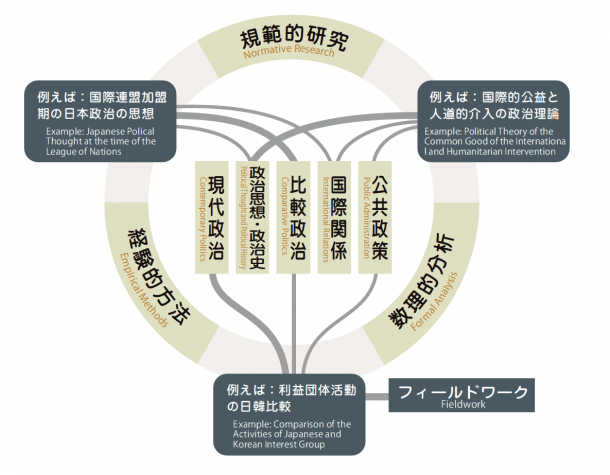 The Political Science Course promotes a systematic and sophisticated approach to political science education within the Graduate School of Political Science and endeavors to be a beacon of international comparative research originating in Japan and firmly grounded in the latest theories and methods employed in the field of political science. To this end, an educational and research system has been established that enable students to study political science through a curriculum that is deep in specialized expertise while at the same time comprehensive in scope, covering a broad range of fields. The common platform for the course is an integrated research approach to political science that combines the empirical approach, mathematical analysis and the normative approach. The Political Science Course adopts five research areas as its foundation: Contemporary Politics, Political Thought, Comparative Government, International Relations and Public Policy. The Global Political Economy Course is a cutting-edge program which adopts an international perspective in analyzing and understanding the inseparable link between politics and economics while seeking to open up a new field of academic study where feasible policies are discussed and shaped from a normative perspective. In this course, an educational and research system has been established that enables students to gain specialized knowledge of techniques employed in political science and economics, based on which students study cutting-edge political economic science in four subject clusters: Empirical Political Economic Science, Global Political Economy, Political Economic Science Public Policy, and Regional Political Economic Science (Centered on Asia and Japan). Another priority is to provide an educational program that enables students to enhance their practical global governance skills. The Journalism Course, in keeping with the standards of the Graduate School of Journalism–one of the world’s leading-edge graduate schools of journalism-promotes an educational program that develops highly skilled professionals grounded in the five elements required of all journalists: (1) expertise, i.e., scientific knowledge and philosophical understanding in a broad range of specialized fields; (2) deep insight into the role of journalism and the media; (3) the ability to think critically; (4) the ability to report professionally and articulately; (5) a hands-on approach, i.e., thinking which is based in the field. At the same time, specialized research into journalism and cultivating researchers in the field of journalism constitute the foundation for promoting the course. In particular, an educational system will be established that organically links journalism with academia in the respective specialized fields of science and technology, politics, international affairs, economics, society and culture, based on the foundation of educating students about “methodologies” that guarantee the objectivity and fairness of investigative reporting. Waseda University welcomes numerous students from across Japan and all around the world who share in the University’s principle of nurturing a “progressive spirit”-students who possess a certain degree of high academic skills with abundant curiosity, and who are individualistic and filled with the enthusiasm to formulate plans on their own and actively address challenges of all kinds. The University is committed to broadly providing the opportunity to take entrance examinations to a diverse array of students who are highly motivated to conduct research and possess outstanding research abilities, irrespective of whether the students are from Japan or overseas. To this end, the University administers general entrance examinations, entrance examinations for international students, and entrance examinations for returning students, for entry into the University in April or September. For Applicants and other students seeking entry through recommended admissions or a double degree program, admission office-managed examinations are administered. Waseda University expects the following from students taking entrance examinations: language proficiency in both Japanese and English that is needed to conduct research from a global perspective; the ability to think and express oneself logically in order to conceive and realize creative research; and mature personal qualities and practical skills needed to complete research, as befitting a member of an intellectual community. The Political Science Course uses five research areas as its foundation to enable students to study political science in a specialized and focused, yet comprehensive, manner. Naturally, each student learns about those areas which directly impact his or her research focus, but in addition, students also learn about those areas which do not impact their research directly. This allows students to undertake interdisciplinary research from a multifaceted perspective. Analysis of administrative theory and policy from the local to the global level from a multifaceted perspective which includes the law, political organizations and systems, etc. In the Political Science Course, students are able to thoroughly learn the analytical methods which undergird all of the research areas. By first learning empirical, mathematical and normative methodologies, students receive a firm grounding in the core analytical approaches used in political science research. They are able to approach their research topic from a variety of angles and cultivate a key strength of world-class, original research. Some people might resist having to learn analytical methods which, at first glance, appear to be unrelated to their area of research; however by mastering a variety of analytical approaches, students will see a definite improvement in the depth and breadth of their research. The analytical approaches used in political science evolve daily, and the methodologies taught in this course also continue to evolve through a process of enhancement and diversification. The Graduate School of Political Science takes the stance that inter-collaboration amongst the five research areas makes cross-cutting, original research possible. And by adopting a methodology that incorporates normative, empirical and mathematical analyses, it is possible to produce original research which is without precedent. For example, normative and empirical methodologies can be applied to analyzing the political thought and international relations that underlie issues of humanitarian intervention. On top of this, mathematical analysis can be applied to such questions as whether it is possible to formulate just, rational humanitarian intervention policies which serve the common good of the international community. These sorts of research endeavors become possible. Research supervision is based on the idea of joint supervision by all faculty members in the different research areas, with such supervision being carried out at appropriate times, such as the presentation of a master’s thesis research plan or mid-term report. Working in conjunction with this joint supervision system are the Research Supervisor (Main Advisor) and Sub-advisor who are connected with an individual student’s area of research interest and provide their students with individual guidance. The Sub-advisor can be chosen from faculty in research areas other than that in which a student’s research focus is located. For example, a student seeking to study international relations in a particular area while shedding light on the political diversity which exists could choose their Main Advisor from the area of international relations and their Sub-advisor from the area of comparative government. 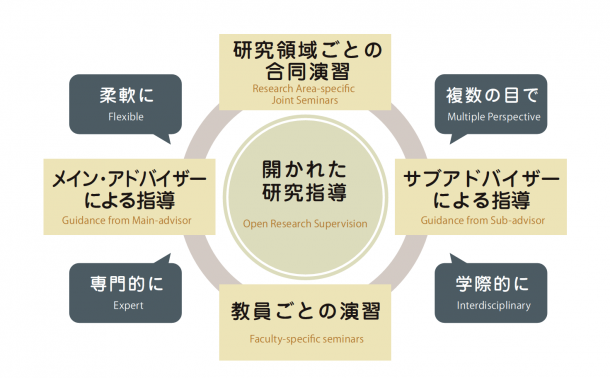 By adopting this sort of flexible research supervision system, the Political Science Course seeks to foster highly-original, world-class research into the field of political science. A uniform five year program starting in the first year of the Master’s Program has been established for those students aiming to continue on into the Doctoral Program and obtain a Ph.D. In the first year of the Master’s Program, students develop the analytical methods which serve as the core strength for conducting advanced research in methodology courses, and in the fall they take an Analysis Method Certification Exam. After passing this and securing a certain level of results from the review of their master’s thesis, the door is open to their advancement into the Doctoral Program. A roadmap is drawn up for students in the Doctoral Program, based on conscientious and thorough research supervision, which guides their research progress in an appropriate direction. All of this constitutes a five-year program of supervision aimed at getting students from their master’s degree to their doctorate. The Global Political Economy Course has been jointly　established in the Graduate School of Political Science and the Graduate School of Economics and is overseen by both. Its aim is to foster the unique development of Global Political Economy as a new area of study and learning. The basic and core classes of this course have been jointly established by both graduate schools, and research supervision and seminars are also jointly undertaken by both. Politics and the economy are deeply intertwined, and the march of globalization is blurring national boundaries. Be it on the global or local level, a complicated political and economic network exists. Global Political Economy is a field of academic enquiry into the interrelation of domestic and international and political and economic affairs. This course was established in 2008 with the aim of teaching Global Political Economy so as to cultivate human resources capable of discussing and designing appropriate policies from a normative perspective. It seeks to produce graduates with a truly global vision who are both academic and practical in their approach. Global Political Economy is a cutting-edge field of academic study which utilizes a close collaboration between the disciplines of political science and economics on the international and domestic levels to further theoretical and empirical understanding of the current, complicated interplay of politics and economics. Waseda University’s Faculty of Political Science and Economics has gathered leading experts in the fields of political science and economics to create an optimal learning and research environment for students with a desire to tackle this cutting-edge field of academic study. Furthermore, the Faculty of Political Science and Economics (as a 2008 Ministry of Education, Culture, Sports, Science and Technology 21st Century Global COE Program) established the “Political Economy of Institutional Construction: Toward an Expectation – Realizing Society” (G-COE GLOPEII). Amidst the tangled interplay of politics and economics, how can institutions be constructed which will realize the expectations of society? This is the question which this research project seeks to answer, and it will involve the participation of a broad swath of graduate students. The Graduate School of Political Science and the Graduate School of Economics are making a full-scale effort to develop the emerging field of Global Political Economy. This is an enormous, cutting-edge undertaking of which you too can be a part. As the figure on the right shows, this course has been established as a joint course in the Graduate School of Political Science Master’s Program and the Graduate School of Economics Master’s Program. Research supervision is performed through close cooperation between the two schools. Basic courses for teaching methodology, etc., and core courses for teaching specialized information and points of view are offered as joint courses overseen by both graduate schools. Research supervision and seminars are also jointly undertaken by both. For Students who have completed the Master’s Program, the path is available to them to continue on to the Doctoral Program of their respective graduate school to engage in more in-depth research. In April 2008, the Graduate School of Political Science established the Journalism Course. This constituted Japan’s first Graduate School of Journalism, capable of conferring students with a Master’s of Journalism degree. The establishment of this graduate school was the result of expansion and development in the pioneering Master of Arts Program for Journalist Education in Science and Technology which began in 2005. With the wave of globalization and the introduction of the Internet, the very media structure itself is changing. The turmoil faced by contemporary society calls for journalists who are practical-minded with a high level of expertise. Such journalists will be expected to demonstrate a keen awareness of where specialized knowledge and the public sphere will intersect with regard to the various issues facing contemporary society, from politics, economics and international relations to science and technology. This course has students work closely together with researchers in various specialized fields and current professional journalists to cultivate journalists with a high degree of expertise and to serve as a meeting point between the academy and the world of journalism. Through the creation of this new graduate school, the Graduate School of Political Science seeks to contribute to the creation of a new journalism, the cultivation of professional journalists and the development of a global public sphere. Waseda University has a tradition of – and track record in – journalism-related research and education, and it has produced a number of outstanding journalists. This tradition is carried on in the Journalism Course (known colloquially as the “J-School”), and it provides a level of journalistic education that is cutting edge even by international standards. This program is based on the following five concepts. It is important for journalists to be able to perceive the essence of the issues facing society and to have the cognitive ability required to flesh out constructive arguments. In the J-School, students are provided with courses that build up the knowledge and logical thinking that serve as the foundation for these skills. As the media structure changes, society’s criticism of traditional journalism and the mass media increases. However, while the Internet has made it possible for anyone to make their views widely available, in order to arrive at essential debate and further the function of professional journalism, one must be familiar with journalism’s structure, history and theory. At the J-School, students will find courses that help to deepen their thinking in this regard. Everything is becoming increasingly complicated these days, and journalists are expected to have the specialized knowledge to make matters more comprehensible to society. In the J-School there are a variety of courses in politics, world affairs, economics, society, culture and science and technology aimed at cultivating journalists with a high degree of specialized knowledge. Even if a person has the desire to change society and the ability to ferret out the underlying source of problems and issues, without the ability to properly arrange and convey this information to people, real journalism will not happen. Through various courses designed to enhance their expressive abilities, students in the J-School learn everything from how to write copy to how to speak in front of a camera. The education offered at the J-School aims to be grounded in hands-on experience, to provide a true fusion of academic knowledge and journalism. Where university-level journalism education has traditionally been lax, the J-School focuses its energy on offering hands-on courses, like Newsroom, where there is a low student-to-teacher ratio and the instructors are journalists themselves. In addition, internships are required as part of the J-School’s focus on fostering a hands-on approach to journalism. The 21st century has been called the ‘Era of Asia’, and the J-School collaborates in education and research with other leading journalism schools in Asia, seeking to cultivate internationally-minded people who will help develop the Asian public sphere. As part of this joint international endeavor, the J-School develops both Japanese journalists well-versed in Asia and Asian journalists well-versed in Japan. The J-School has been established within the Graduate School of Political Science; however, enrollment does not depend on one’s major. After entering the J-School, students consult with their advisors and decide on a study plan which will further deepen their expertise in their own area of specialization as well broaden their academic field of vision. The Journalism Course is available ONLY in Japanese. Students will receive strong support as well as training in the communication skills that will allow them to carry out original research leading to a doctoral dissertation. Multifaceted research supervision is provided through individual consultations with research supervisors and sub-advisors as well as guidance by instructors in each student’s affiliated field of study and other study areas. This supervision and guidance is carried out in line with the research plan submitted at the time of admission into the Doctoral Program and in consideration of each student’s character and awareness of issues. The Graduate School of Political Science offers a variety of international study programs, including a master’s and doctoral program double degree. By learning methods for academic presentation in English, students will sharpen their international communication skills. Also, a research workshop comprised primarily of young researchers is facilitated to enable students to cultivate their research organizational strengths. Roadmap to your Ph. D.
A research roadmap is drawn up for each student based on their desired focus and in support of research which is distinctive and original while establishing checkpoints along a path leading to the conferral of a doctoral degree. During the first year, a list of required reading both directly and indirectly related to the student’s field of study is provided, and supervised reading is carried out by young researchers and research supervisors. In September of the first year, there is an “Area Completion Exam” designed to gauge how much the student has learned. During the second year, in order to gear students towards the writing of their doctoral dissertation, there is a “Dissertation Concept Exam” held to assess the adequacy of a student’s dissertation concept and to check the orientation of their research. Review of the completed doctoral dissertation is conducted in a rigorous and fair fashion by a dissertation review committee. Support mechanisms are also in place to help ensure appropriate progress is made on research leading to early attainment of a doctoral degree. <<https://www.waseda.jp/fpse/gsps/en/>> doesn't support your system.